University of Nebraska Press, 9780803246928, 232pp. 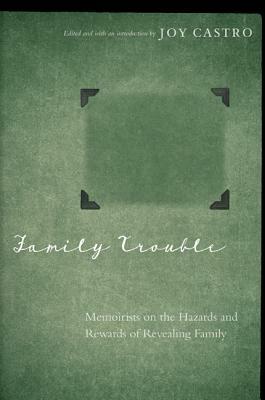 Essays by twenty-five memoirists, including Faith Adiele, Alison Bechdel, Jill Christman, Judith Ortiz Cofer, Rigoberto González, Robin Hemley, Dinty W. Moore, Bich Minh Nguyen, and Mimi Schwartz, explore the fraught territory of family history told from one perspective, which, from another angle in the family drama, might appear quite different indeed. In her introduction to this book, Joy Castro, herself a memoirist, explores the ethical dilemmas of writing about family and offers practical strategies for this tricky but necessary subject. A sustained and eminently readable lesson in the craft of memoir, Family Trouble serves as a practical guide for writers to find their own version of the truth while still respecting family boundaries. Joy Castro is a professor of both English and ethnic studies at the University of Nebraska–Lincoln. She is the author of several books including Island of Bones (winner of an International Latino Book Award in nonfiction), The Truth Book, and How Winter Began: Stories.